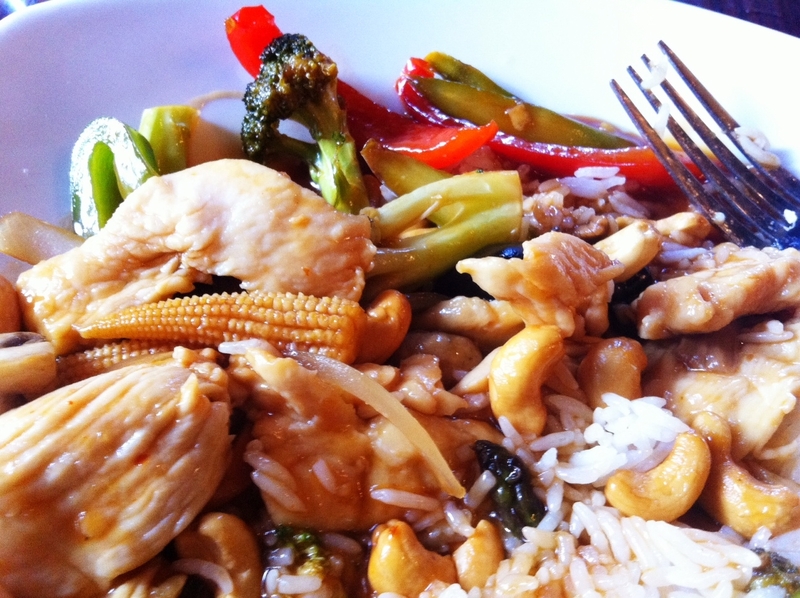 Cashew Chicken is a dish that’s popular in most Chinese and/or Thai restaurants. It’s a versatile given the fact you can throw in the veggies of your choice as long as the chicken and cashews are a constant. 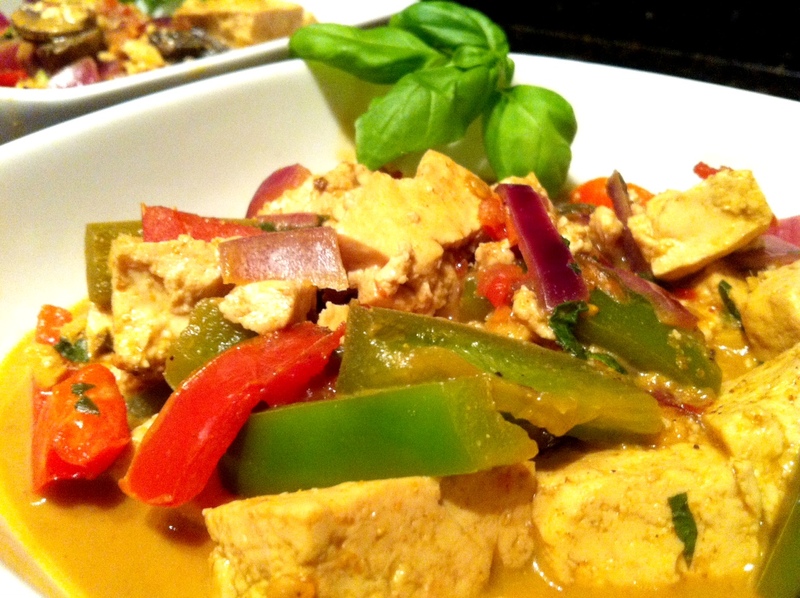 This recipe includes a sweet/spicy sauces to accompany the veggies, chicken and cashews. The best part is that it’s loaded with nutrient-rich veggies and protein-rich chicken. To make the marinade, dissolve 2 tsp of cornstarch in 2 TBSP of soy sauce and 1 TBSP of water in a medium-sized bowl. Add chicken pieces and stir to combine. Set aside to marinate for at least 30 minutes. 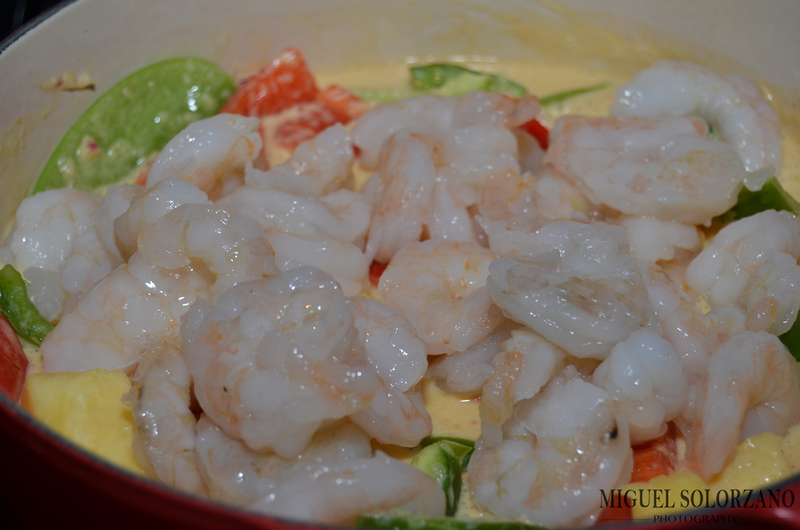 Combine all sauce ingredients and whisk to mix to make the sauce. 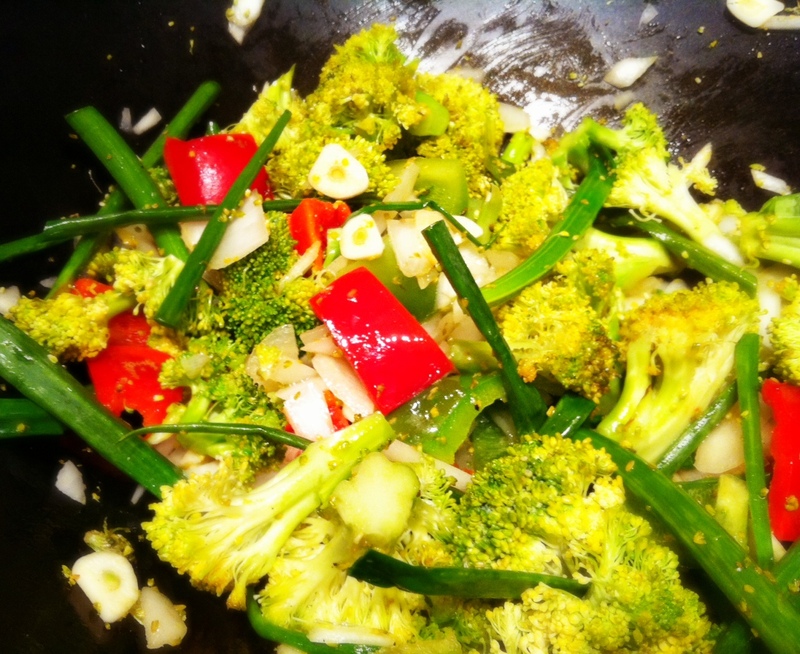 In a wok or large pan, saute the onion, garlic, red pepper, broccoli and green onion in oil over medium-high heat for about two minutes. Add the marinated chicken and mushrooms. 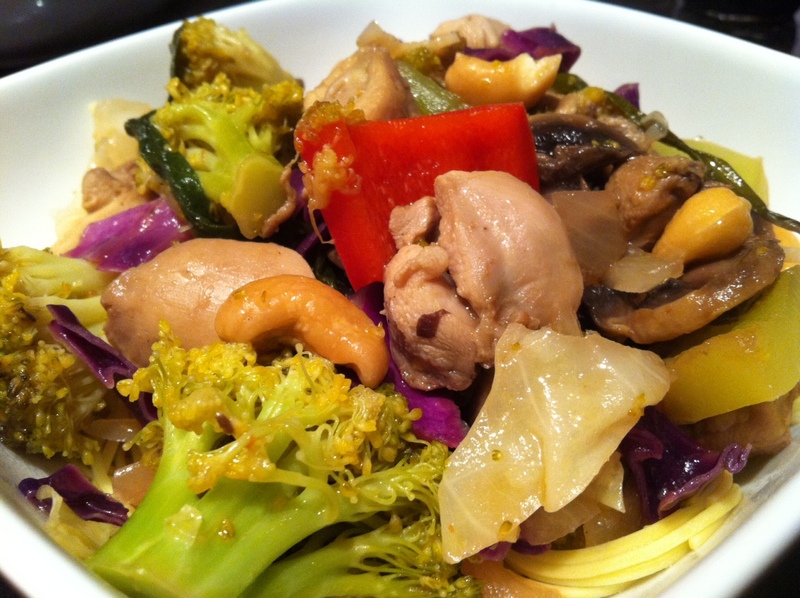 Continue stir frying until chicken pieces are cooked (up to five minutes). If the wok becomes dry, add broth or white wine (1 TBSP at a time). Add the cabbage and continue stir frying another 2 minutes. Add the sauce and cashews to the wok then add the cornstarch powder dissolved in water and soy sauce. Continuing stirring until all ingredients are well combine and the sauce thickens. While cooking, taste test for salt and sweetness. If it’s too sour, add more sugar. If it’s not salty enough, add more fish sauce. If you don’t own a wok, I highly suggest investing in one. They’re perfect for stir-fry dishes such as Cashew Chicken. 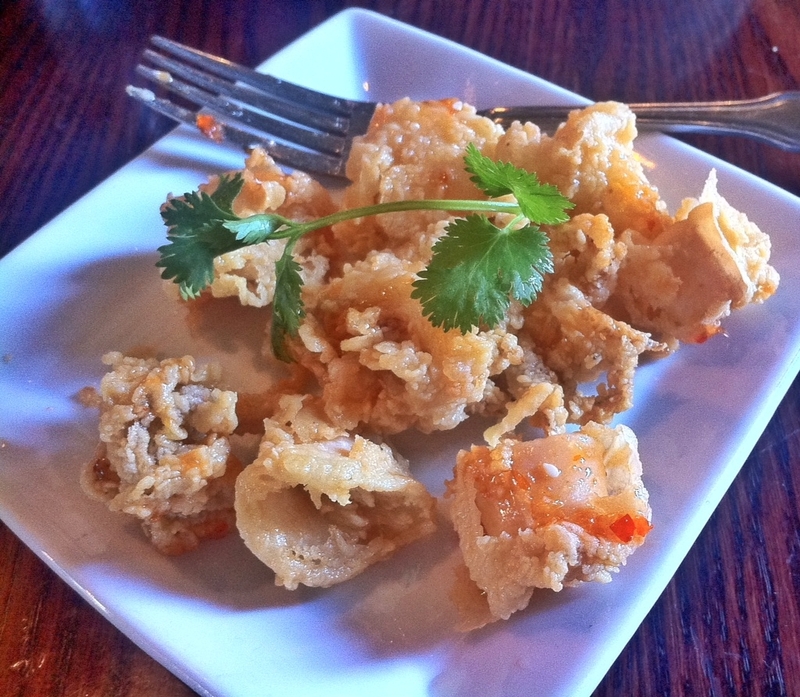 This recipe should suffice when you don’t have the time venture to your local Chinese or Thai restaurant. Also, a side note, but I used salt and pepper cashews from Whole Foods to give my version a little extra kick. Though regular dry-roasted cashews should work just fine. This is one of my absolute favorite recipes to make. 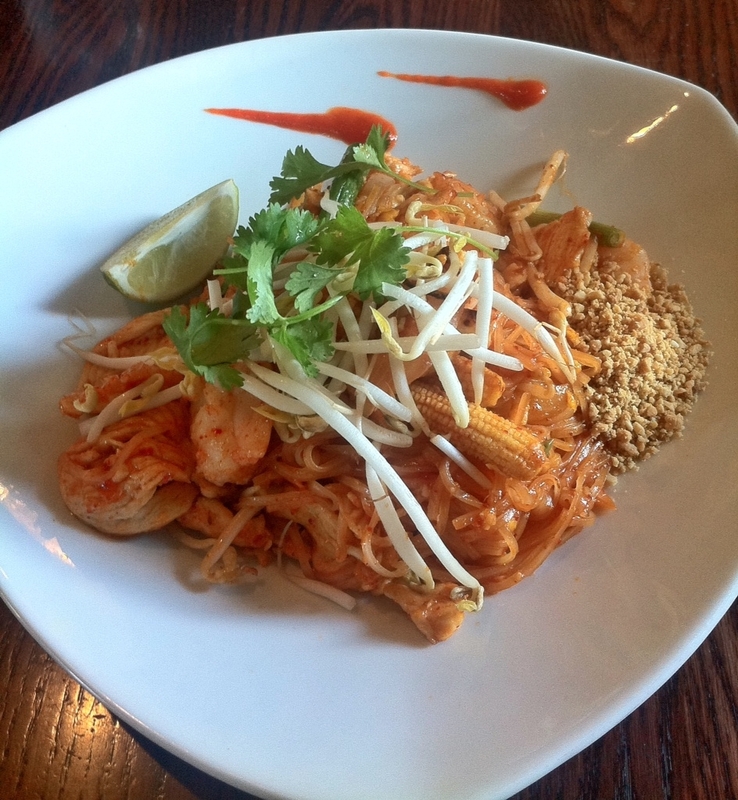 The flavors in this dish are out of this world. It is a little pricey thanks to the duck breast, but it’s 100% worth it. 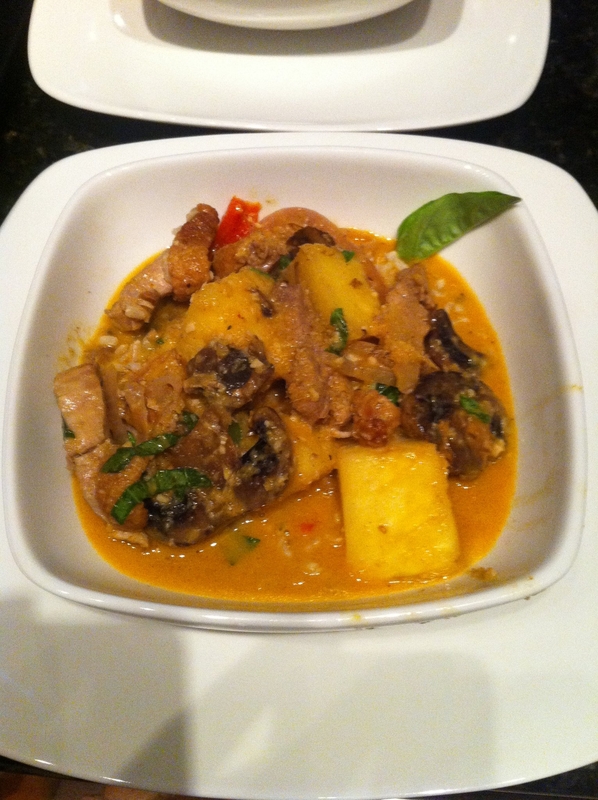 Of course, you can always use chicken, beef or even pork to make the dish. But do any of those meats really compare to duck? Think about it, then go ahead and splurge. Heat 1 TBSP olive oil and 1 TBSP butter in large skillet over medium-high heat. Place duck breasts (fat side down) in skillet and cook for several minutes (until skin is crisp and golden brown, the meat doesn’t need to be cooked at this point). Remove duck from the skillet, cut into slices and set aside. Reduce heat to medium-low and add garlic and curry powder to skillet. Let cook for several minutes so that flavors release. 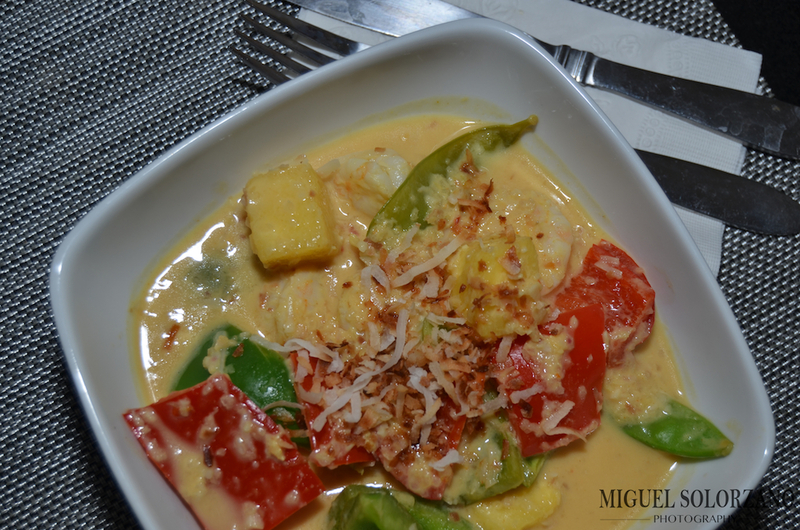 Pour in coconut milk, water, fish sauce and minced ginger. Stirk over low heat for 10 to 15 minutes. In a separate pot (or Dutch oven) heat remaining oil over medium-high heat. 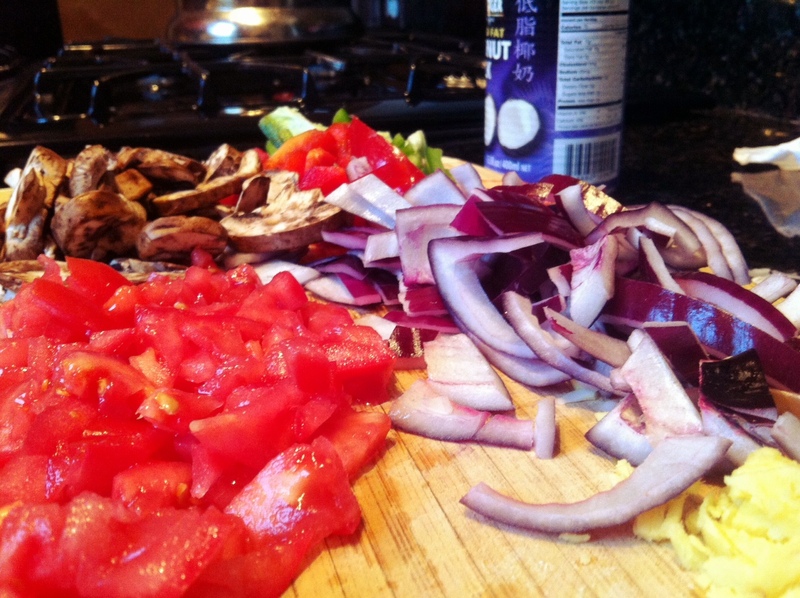 Then add onions, mushrooms and bell peppers and cook for several minutes. Make sure the pot is hot and add the duck. Cook for 3 to 4 minutes, stirring regularly. Add pineapple and cook for an additional 2 minutes. Taste the curry sauce and adjust spices as necessary. 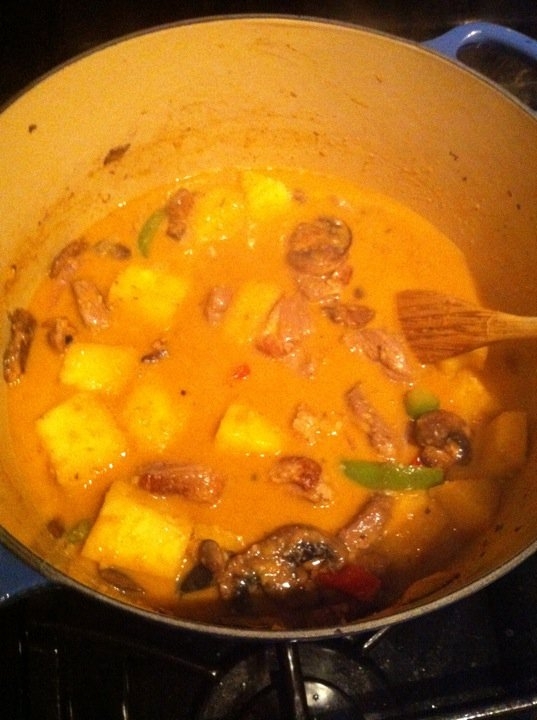 Pour curry sauce into the pot with duck and other vegetables. Stir to combine then simmer for 5 to 10 minutes. 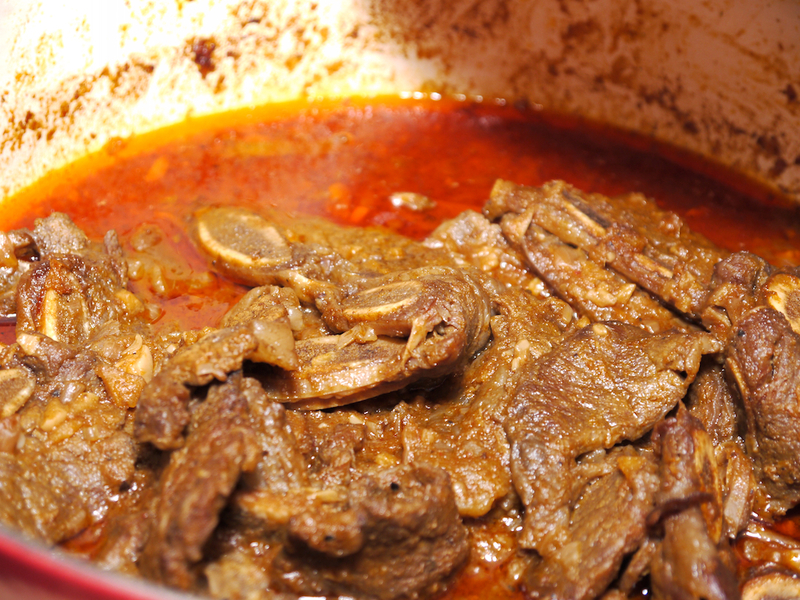 Check sauce’s consistency and add more water if too thick or simmer longer if too watery. Add chopped basil and serve immediately over jasmine rice, spooning sauce into the bowl. This recipe may seem overwhelming, but once the curry paste is prepared, it really is a breeze to make. And if you still think it’s time-consuming, I promise you the flavors will make you forget all about the labor. This is a recipe you will want to make over and over again. It’s that good. Here’s a great slow cooker recipe. I love my Dutch oven (almost as much as I love my iron skillet) so it’s something I cook in quite a bit. This short ribs recipe features Thai flavors that are bold and intense. While this recipe does take several hours, it’s definitely worth it. The short ribs will melt in your mouth once slow cooked. 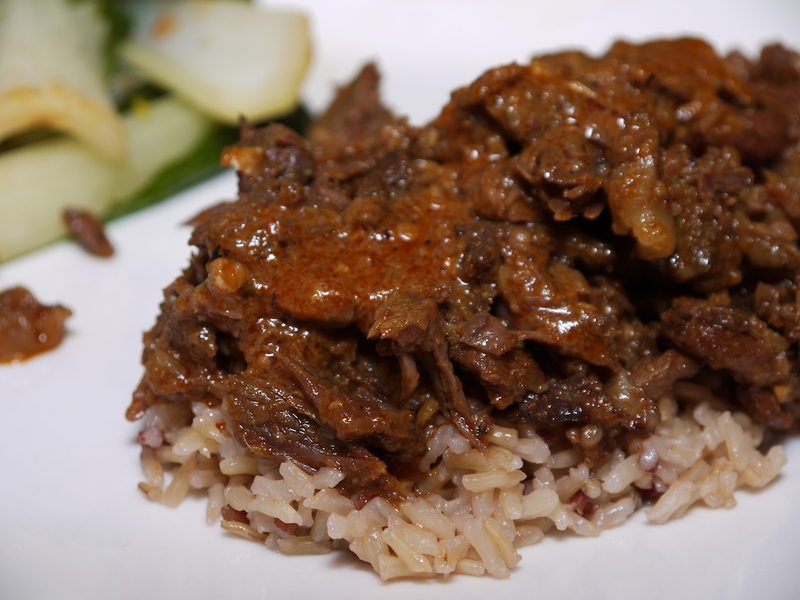 The sauce soaks into the rice making a great bed for the rich flavors of the short ribs. Heat chili oil in a medium Dutch oven over medium-high heat. Season ribs with salt and pepper. Add half of the ribs to the Dutch oven and cook 2 minutes on each side until browned. Set aside and repeat with remaining ribs. Saute garlic, shallots and ginger in Dutch oven for about 2 minutes. 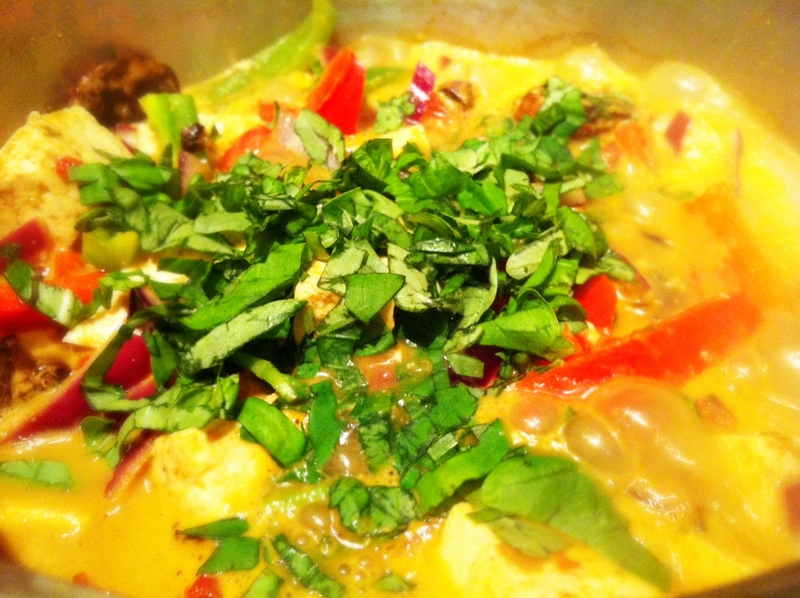 Stir in 1/4 cup water and curry paste and cook another minute. 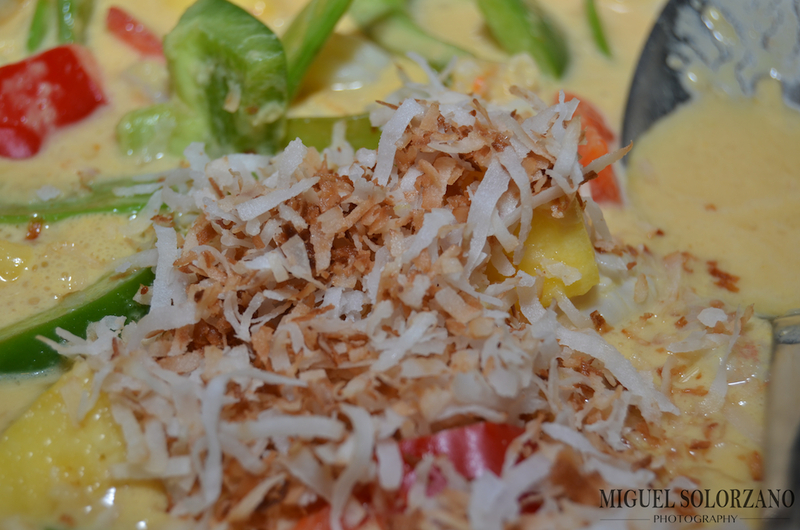 Stir in coconut milk, sugar and fish paste. Add ribs pack to Dutch oven and cover and cook in over for 6 hours. Remove ribs from cooker and set aside, but keep warm. Strain remaining liquid through a colander over a bowl. Place a zip-lock bag in a 2 cup measuring cup and pour liquid into the bag and let stand for about 10 minutes. After the fat has risen, seal the bag and cut off one of the bottom corners. Drain the drippings into a bowl, stopping before the fat drains. 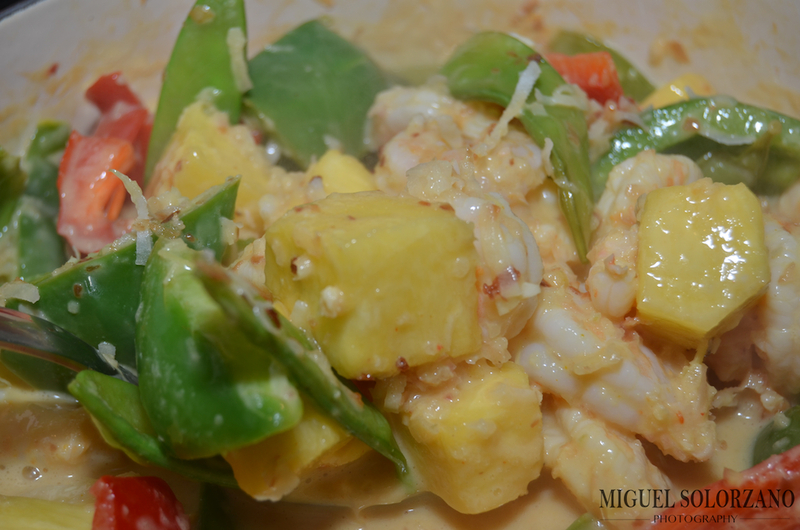 Stir salt, pepper, lime rind and lime juice into the sauce. Shred the rib meat while removing the bones. Serve the ribs over rice and top with sauce. If you don’t have a Dutch oven, you’re welcome to cook this in a Crock Pot. I’m sure it will work just as well. You can also kick up the spiciness of the dish by adding in some sriracha. Serve with a side of sauteed bok choy.